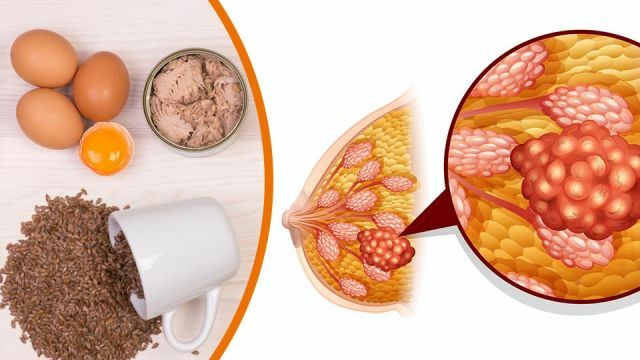 By now, most of us know that omega-3 fatty acids are good for our health, but recent research suggests that high-quality omega-3s can ward off breast cancer. In fact, three servings of omega-3 fatty acids derived from fish each week may be eight times more effective at halting aggressive breast cancer than plant-based alternatives. In a study from the University of Guelph in Ontario and McGill University in Montreal, published in the Journal of Nutritional Biochemistry, scientists found that EPA and DHA are the best omega-3 fatty acids for combatting one of the most aggressive forms of breast cancer, HER2-positive breast cancer. Eicosapentaenoic acid (EPA) and docosahexaenoic acid (DHA) are omega-3s derived from fish oil. The third type of omega-3 that the team studied was a-linolenic acid (ALA), which is found in plant-based sources including flaxseed, soy, and canola oil. For this study, researchers compared the effects of EPA, DHA, and ALA on breast tumor development in mice who were bred to develop HER2-positive breast cancer. The study is the first of its kind to compare fish-based omega-3s with the plant-based alternative. It should be noted that all omega-3 fatty acids protect the body against cancer. However, the mice who were exposed to EPA and DHA experienced a 60 to 70 percent reduction in tumor size. They also experienced a 30 percent decrease in the number of tumors. To achieve the same results with plant-based ALA, the mice had to be given much higher doses. According to the study, EPA and DHA help prevent cancer by activating genes that aid in the body’s immune system function. This, in turn, inhibits pathways that cause tumors to grow. In contrast, ALA was only 1/8 as strong at fighting tumors. As co-author Professor David Ma states, these results are promising when it comes to other cancers. So eating three portions of high-quality fatty fish like salmon, tuna, or trout each week could significantly reduce the likelihood of developing cancer. You can also gain similar benefits by eating eggs or regularly taking fish oil supplements. As you add more fish to your diet, steer clear of a few key species. Swordfish, ahi tuna, bigeye tuna, tilefish, marlin, king mackerel, shark, and orange roughy all contain high levels of mercury. Children younger than six years old should not eat these varieties, nor should women who are pregnant or nursing. Exercise restraint when it comes to tuna – it’s the most common source of mercury in the American diet. Choose light or skipjack tuna and keep it to two servings a week. Children are advised to avoid albacore tuna altogether. Also, according to NRDC, since most sushi fish are apex predators, they often have more mercury in their system. Tuna, yellowtail, and sea bass tend to have the highest amounts of mercury. A good rule of thumb is to opt for smaller fish and shellfish such as scallops, sardines, crab, clams, or anchovies to reduce your exposure to metal. With a little creativity, adding more fish to your diet is easy. Whether it’s in the form of a salmon omelet one morning or some sardines on your salad at one dinner, cancer-fighting omega-3s are a simple and worthwhile addition to your week.